In the summer of 2000, David Hlavsa and his wife Lisa Holtby embarked on a pilgrimage. After trying for three years to conceive a child and suffering through the monthly cycle of hope and disappointment, they decided to walk the Camino de Santiago, a joint enterprise—and an act of faith—they hoped would strengthen their marriage and prepare them for parenthood. Though walking more than 400 miles across the north of Spain turned out to be more difficult than they had anticipated, after a series of misadventures, including a brief stay in a Spanish hospital, they arrived in Santiago. Shortly after their return to Seattle, Lisa became pregnant, and the hardships of the Camino were no comparison to what followed: the stillbirth of their first son and Lisa’s harrowing second pregnancy. Walking Distance is a moving and disarmingly funny book, a good story with a happy ending—the safe arrival of David and Lisa’s second son, Benjamin. David and Lisa get more than they bargained for, but they also get exactly what they wanted: a child, a solid marriage, and a richer life. David Hlavsa heads the Theatre Arts Program at Saint Martin’s University, where he has been teaching acting, directing, and playwriting since 1989. Beautifully written. Moving, elegant, funny, and deeply human. Walking Distance is funny, compelling, and familiar. You care about the characters (adorably flawed, both of them), and you want to know what is going to happen to them. And what does happen to them is life—not an easy life, but real life. The story has all the elements of a good film: comedy, tragedy, and redemption, with lovely arcs for each of the characters as well as for their relationship, which really is a character in and of itself. Walking Distance is a profoundly unique memoir. David Hlavsa invites the reader into a sacred place where the numinous meets the secular, where humor and suffering intersect, and where life and death coalesce. Few literary pieces allow such an authentic glimpse into the world of profound love and loss. David Hlavsa shares a most intimate and personal story of love and life, mirroring something we all face. Grief comes and everything becomes foreign. We don’t know the language. The map we used before makes no sense now. We all love our children, living and dead. The love continues. The path continues. Deeply inspiring. For some couples wanting a baby and having one is like a walk across a backyard garden—sweet and swift. For others, it’s a pilgrimage of passionate endurance. 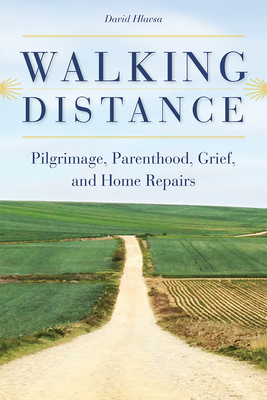 Walking Distance is a poignant and captivating account of a hard journey—written with humor and humility by a loving husband and father.